Supernatural horror cheapy "Phantasm: Ravager," the fourth (and hopefully last) sequel to Don Coscarelli's 1979 horror gem "Phantasm," is for established fans only. Sure, the film's creators do their due diligence, and try to get newcomers up to speed with flashbacks that allude to the by-now unnecessarily convoluted story of three friends' decades-long struggle to defeat the Tall Man, an evil body-snatching under-taker from another dimension. And "Ravager" does have an internal logic that makes its time and subplot-jumping story easy to follow. But this new "Phantasm" will not be of interest to anyone who doesn't already know who the Tall Man is, or why he needs to be stopped. The stakes are higher this time—apparently, the Tall Man wants to dominate the world now!—and the characters' back stories are a little clearer. And there are a lot of pleasing callbacks to the previous films. But there's nothing so viscerally exciting in "Ravager" that newcomers have to see. Like "Phantasm" before it, "Phantasm: Ravager" has a shambling dream logic that can be attributed to individual characters' subjective points-of-view. 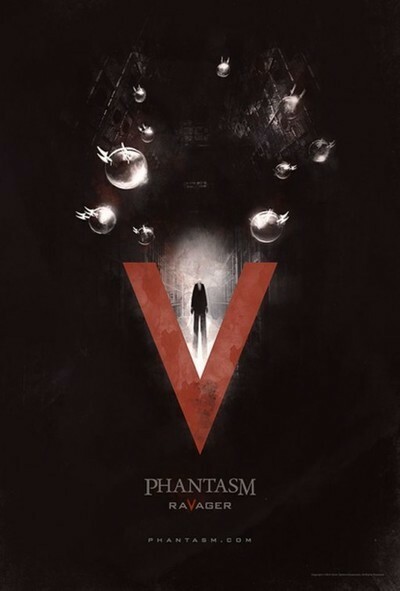 In the first "Phantasm," young Mike (A. Michael Baldwin) may or may not be projecting his adolescent fears of death onto the Tall Man (recently-deceased horror icon Angus Scrimm), his flying silver sphere heralds and his cloaked little people minions. "Phantasm: Ravager" has a similar logic, but the film isn't Mike's story. In fact, "Ravager" is the first film to be told from the perspective of Reggie (Reggie Bannister), a happy-go-lucky ice cream man who vowed to stop the Tall Man after his family was, uh, blown up by Scrimm's inhuman villain. Reggie, like us, yearns for a sense of closure from his adventures. But he, now significantly older, can't think straight: his mind flashes back-and-forth between three competing timelines, one that takes place after the last sequel, one set in a far-flung future where the Tall Man has conquered the world, and one in a divergent timeline where Reggie's a doddering, dementia-addled old man in a retirement home. This, understandably, makes Reggie confused. Thankfully, there's an internal logic and a lot of hand-holding expository voiceover narration to keep viewers oriented. Reggie, motivated by his sense of obligation to Mike's deceased older brother Jody (Bill Thornbury), still feels obligated to take care of Mike. But Mike's an older man now, and the events Reggie's currently experiencing may or may not be happening. He's so disoriented because he, like us, can't understand a world where anti-Tall Man freedom fighters Dawn (Dawn Cody) and Chunk (Stephen Jutras) are more important than Mike or Jody's story. Where are the other guys we know and love? That question motivates Reggie's quest for resolution in "Ravager," making his reunion with multiple versions of Mike feel that much more satisfying. Reggie is our surrogate, adrift in an ever-shifting history of a horror franchise that's gotten away from its original simplicity. I can't be too mad at the makers of "Ravager" because I am the ideal viewer they're trying to win over: the diehard fan that has seen all four previous "Phantasm" films, and suffered through many inane plot twists about the Tall Man's time-travel origins, and bizarre obsession with Mike. Still, "Ravager" only works when it's a piece of straight-up fan service. Everything from the past is terribly important because it helps Reggie feel motivated enough to stop the Tall Man. Exhaustion has set in, so we need references to tuning forks, "thousands" of Tall Men, and even obscure references to supporting characters like the fortune-teller and Lady in Lavender that were previously only in the first "Phantasm." Think of "Ravager" as a memory exercise: if you can remember these characters, you'll probably leave feeling at least a little satisfied. Coscarelli's original movie has just been restored and re-released theatrically, and on VOD: why not just revisit it? The additional elements that "Ravager" supplies are negligible, and the CGI-intensive action scenes are distractingly ugly-looking. The camerawork is also amateurish, and the film's drab, undistinguished dialogue is only interesting when it's explicitly calling back to the original "Phantasm." Watching "Phantasm: Ravager" is a bit like attending to an itch you never really needed scratched. You can do it, and it'll feel good, but I'm not really sure you should.